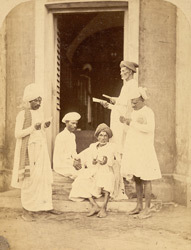 Photograph of bill collectors at Madras in Tamil Nadu, taken by Nicholas & Curths in c. 1870, from the Archaeological Survey of India Collections. After photography was introduced into India in the 1840s it rapidly grew in popularity, particularly as a means to record the vast diversity of people and their dress, manners, trades, customs and religions. The first official attempt to create a comprehensive record of Indian types was the 'The People of India'; an ethnographical survey edited by John Forbes Watson and John William Kaye, and published in eight volumes from 1868 to1875. This image of a group posed with bills at the doorway of a house is from the series of 'Photographs illustrating various native classes, occupations, &c....Native bill collectors,' shown at the Vienna Exhibition of 1873 and mentioned in Watson's catalogue of the Vienna Exhibition.